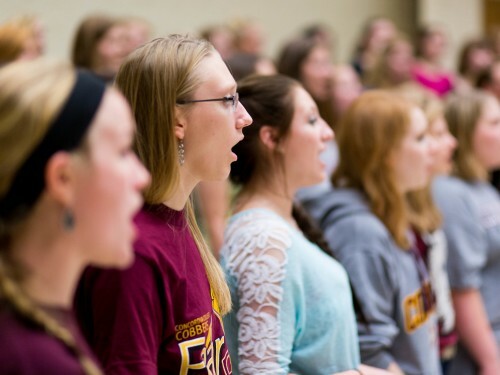 Concordia College is known both nationally and internationally for its excellence in choral music. Any student who would like to be part of a choral organization this year is encouraged to audition in the fall. All students are welcome to audition for a choral group regardless of previous singing experience. Auditions are brief (6 minutes) and easy to do. Watch this video about voice checks. Auditions will take place during orientation days (August 26-29). Come to Hvidsten Music Hall, Room 145, to get your audition form. Sign up for an audition time on the time schedules posted outside of Room 145. You do not have to prepare anything prior to your audition. Auditions will be held in Hvidsten, Room 145. Auditions for the 2019-20 academic year will be completed in April 2019. Auditions dates and times will be posted in the Hvidsten Hall of Music during move-in week. Please prepare either the excerpt posted with the signup sheet, or 12-16 bars of a different jazz standard. In addition, auditions will consist of repeating a melody, sight-reading, and range testing. Be part of an immediate community of friends. Interesting fact: most choir members are not music majors; they represent all areas of study. Join now and enrich your Concordia experience.